Public transit system works very well and being that it's a mid-to-small sized city, it's also very walkable. Try the Bacalhau - salted, dried cod - you'll probably see it as "com natas" or "à Brás" most often. Delicious and a local dish. Airbnb We love airbnb because it gives you the opportunity to really feel like you live in that city, which in Porto is a very special feeling. My Ribeira Guest House Stopped here for drinks one afternoon and were shown some of the rooms by the owner. It looks like such a cozy and beautiful place to stay. Mercador Guesthouse Near many art galleries, cafes and shops, and walking distance to almost anything in the city. Stash casual sandwich spot by Michelin starred chef. Lunch for two with wine around 18 euros. Merceria das Flores great spot for a quick bite and a drink in the middle of the action. Also sells a bunch of local goods and pastries. Be prepared to be tightly packed in the tables, as the space is quite small. Casa Guedes a casual tasca (traditional old spot) known their for pork sandwiches and rose wine. Cheap, delicious and very local environment. Cervejaria Brasão book ahead for lunch here. The rustic tiled floors, wooden accents and stone walls make it look as if it’s been around forever, but it opened in 2014 and has had the locals lining up ever since. Petiscos the Portuguese version of tapas has been a recently popular trend. Taxca get the traditional caldo verde soup and rose or beer on tap. Great ambiance, affordable and the food is delicious. We ate here twice! Combi Coffee truck that moves around town. Roasts their own beans, the owner is a legend and the coffee damn good. Era Uma Vez no Porto my favorite little bar in Porto. tucked away upstairs, you feel as if your having drinks in a friend's apartment and it has a small terrace with views over the street action and historic churches. Cafe Candelabro cafe/bookshop/bar - the spot to hangout at all hours of the day. , coffee by day and cocktails and snacks by night. Great neighborhood to walk around before/after too. Do a Port tasting at the Port cellars in Gaia, across the river: Sandeman, Taylor's, and Ferreira are the best and the tastings should be less than 10 euro. Garrafeira de Carmo dimly lit wine shop with a few simple tables and a menu of selected Portuguese wines. You can also pull a bottle from the shelves and drink it there. Palácio de Cristal huge domed pavilion built in 1956 which replaced the 19th century iron-and-glass "Crystal Palace." It is surrounded by a lake, flowerbeds, and roaming peacocks, all overlooking the Douro River, of which there are superb views. Livaria Lello lavishly designed historic book store with an art nouveau exterior & a winding wooden staircase. Extremely touristy, though – when we arrived there was a massive line to get in, and you also have to pay to enter. Go early in the morning if you want to actually visit this place without the crowds! Take a boat up the river to Douro Valley the wine region 90 minutes from Porto. The boat ride (book here) is beautiful and hit some of the wineries. Sé do Porto A Porto landmark, the twin-towered cathedral is a showcasing of gorgeous historic architecture and the plaza leads to a perfect view over the sea of picturesque red-roofed houses that slope down to the river. Matosinhos beach surf spot and local beach 20 minutes drive (or 30–40 on the bus) from Porto’s center & famous for great seafood. A Vida Portuguesa extremely cool shop that sells all local Portuguese goods in historic old building. I could spend hours in here! It gets crowded though. Chocolateria Ecuador artisanal coffee maker that uses a lot of local ingredients in their chocolate. 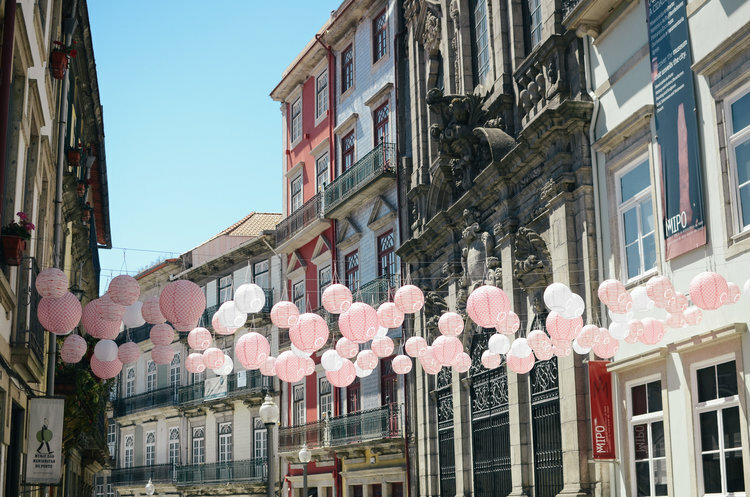 Rua da Bombarda is heaven for shoppers looking for boutiques crammed with goods from homegrown designers. Armazém is a (barely) converted warehouse just off the river, west of Ribeira. 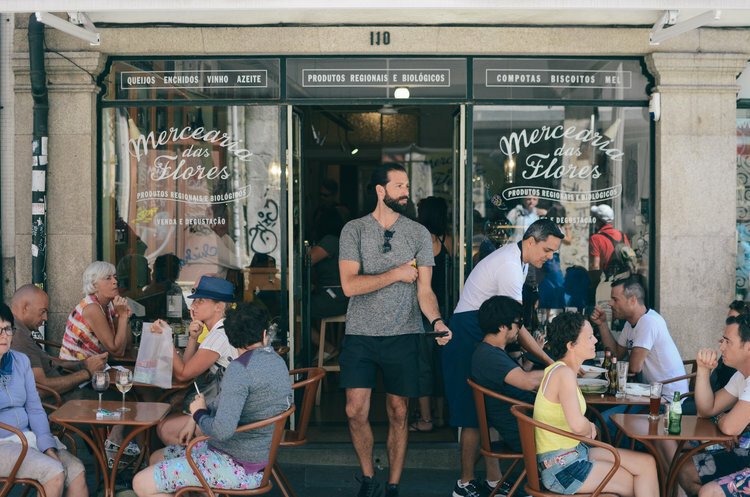 Housing a cafe-bar, gallery and shops selling everything from vintage furniture to artwork to colorful clothes and handbags by the Portuguese design brand Mexxca, this space has something for everyone. Mercado do Bolhão Porto’s most famous market. A Perola do Bolhao 100-year-old grocery store a few feet from the city’s main food market.